The Lear factory supplies seats for FCA's Brampton, Ont., assembly plant, which builds the Dodge Challenger, Dodge Charger and Chrysler 300. 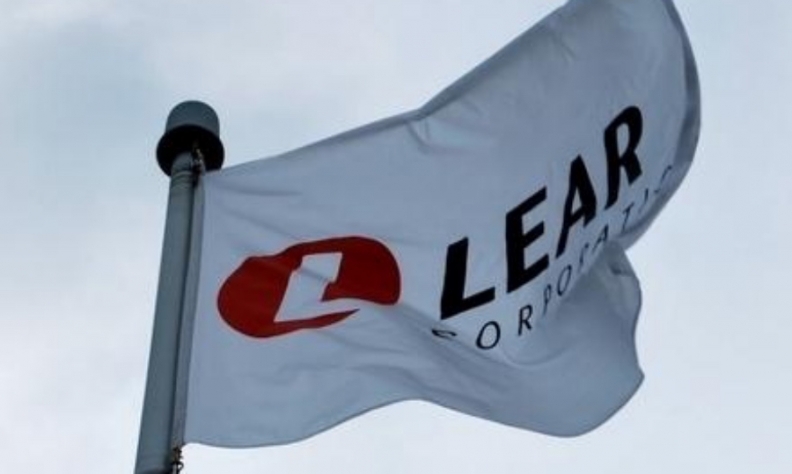 Lear Corp. will close its Ajax, Ont., seating plant after 94 per cent union members who voted there rejected a tentative contract on May 1 and remained on strike. The supplier informed Unifor Local 222 of its decision through a letter sent to the Ajax plant chairman on May 2. The union posted a copy of the letter on Twitter on Thursday morning. The plant’s 320 workers have been on strike since April 28 over disagreements about economic issues such as wages and benefits. Unifor and Lear reached a tentative deal this week but it was overwhelmingly rejected by workers. 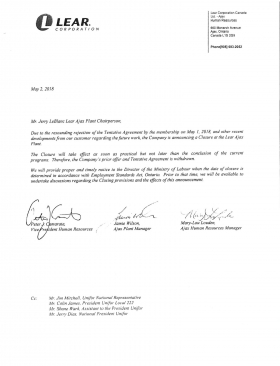 “Due to the resounding rejection of the Tentative Agreement by the membership on May 1, 2018, and other recent developments from our customer regarding the future work, the Company is announcing a Closure at the Lear Ajax Plant,” the letter reads. Lear’s Ajax plant provides seating to the nearby Fiat Chrysler assembly plant in Brampton, Ont. FCA Brampton builds the Dodge Challenger, Dodge Charger and Chrysler 300. It’s not immediately clear from the letter what company officials meant when referring to “recent developments from our customer.” Representatives from FCA and Lear were not immediately available for comment. The letter said Lear would close the plant “as soon as practical but not later than the conclusion of the current programs” at the facility. Unifor Local 1285 President Jaspal Brar, who represents workers at the Brampton plant, said production there has stopped due to the strike. He said he has not heard from FCA regarding its long-term strategy in getting the plant running again in the event of a prolonged strike and the eventual closure of the Ajax plant. “It’s a shame it’s come to this, but obviously we respect the Lear workers and hope something can be worked out to get them back to work,” Brar said. Voicemails left for an FCA spokeswoman were not returned. According to the Automotive News Data Center in Detroit, U.S. inventory levels for the Chrysler 300 stood at 35 days of supply on April 1, down from 41 days on March 1. Dodge Charger supply stood at 80 days, down from 82 in March, and Dodge Challenger inventory was at 74 days, down from 85 days. Average car inventory across all brands was at 66 days on April 1, while FCA averaged 79 days. According to the letter, Lear said it withdrew the tentative agreement and its prior offers. The letter states that the company will provide notice to the Government of Ontario when it determines the plant’s closure date and will be open to discuss “the closing provisions and the effects of this announcement” with the union. Unifor President Jerry Dias said he is confident Lear will rescind the letter and come back to the negotiating table due in part to pressure from FCA to supply seats to the plant. A voicemail left for Unifor’s Brampton plant chair was not immediately returned. The strike caused the FCA Brampton plant to scale back production this week, as the Lear Ajax plant is a just-in-time supplier. It would not be the first time Lear closed its Ajax plant. Lear closed the plant in 2009 after General Motors shut down its Oshawa Truck Assembly plant, which it supplied. The plant re-opened in 2010 following a round of collective bargaining. Wages and benefits have been at the heart of the current labour dispute. An April 10 post on Local 222's website indicated the union foresaw "challenges" with the company in negotiating on economic issues and on the issue of job rotation at the plant. A copy of what Unifor Local 222 says is a letter from Lear Corp. notifying the union the company will close its Ajax plant.